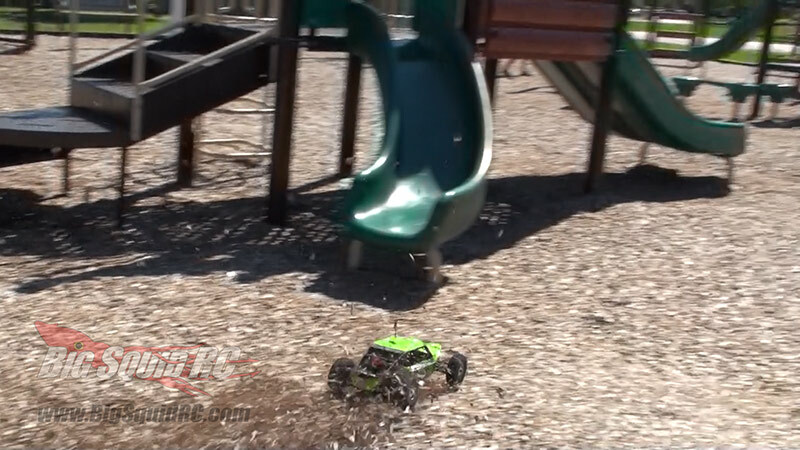 Axial EXO RTR Terra Buggy Review « Big Squid RC – RC Car and Truck News, Reviews, Videos, and More! What’s In The Box: Unlike the kit, the EXO RTR comes build and ready to go with radio, motor and all. You’ll need to supply batteries for the vehicle and controller. Build Quality: Overall the build quality seemed pretty good, except for one issue. It looks like a small number of EXO’s got out the door with the wrong size front dog bones. More about that later. 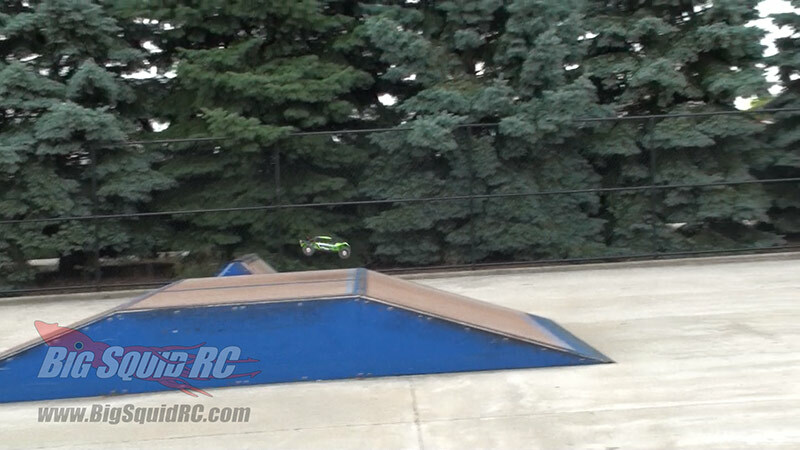 Test Venues: Leisure Hours in Joliet Illinois, 2 different skate parks, and several parking lots. 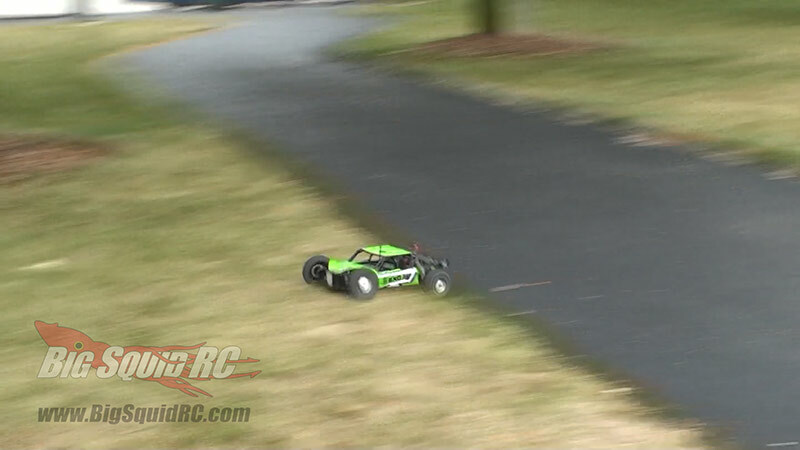 Turning: On the track the RTR Axial EXO feels like it’s on a rail. We had no problems putting the buggy exactly where we wanted it to go. Off the track, in the parking lots and parks we noticed we were not turning as tight as we would of like to see. I think we were so used to our HiTec servo we used in the kit build, the stock AX-4 just wasn’t quite there. And that’s one of those points you’ll need to keep in mind when choosing RTR vs Kit. With the kit, you can put in as high of quality as you want. With a RTR, you get what you get, or your replacing it with what you wanted anyway. Jumping: The EXO kit and RTR both like to go nose down pretty hard off the jumps, so you won’t be letting off the throttle when you are getting the big air. On normal off-road conditions, coming into the landing a little nose down is fine. At the skate parks, or on the bash ramps, you have a serious fight on your hands to keep that nose from slamming down into the pavement. 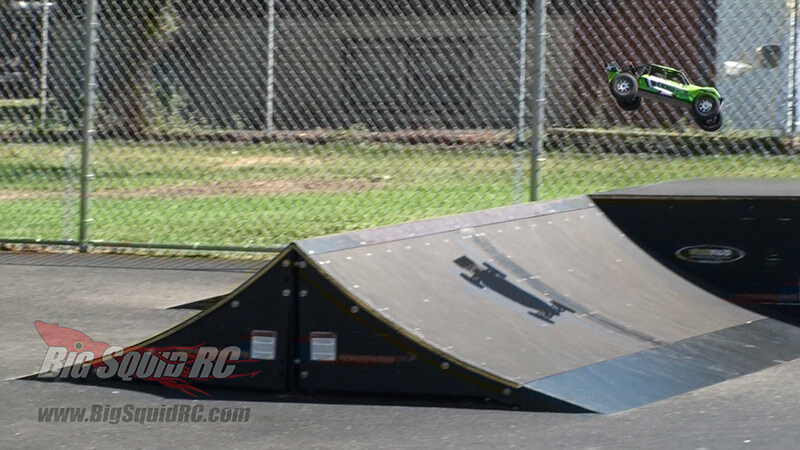 The suspension on the vehicle is real soft, and any type of speed up the ramps seems to push that rear and and chassis into the ramp causing a serious tumble on the way out. 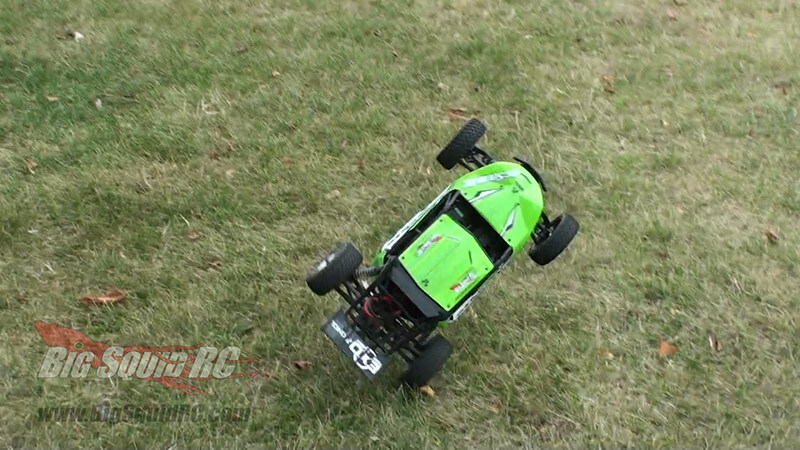 Bumps/Whoops: On the small bumps and whoops, the RTR EXO can hand with the best of them. The suspension eats up the tougher terrain and spits it out as you fly by. 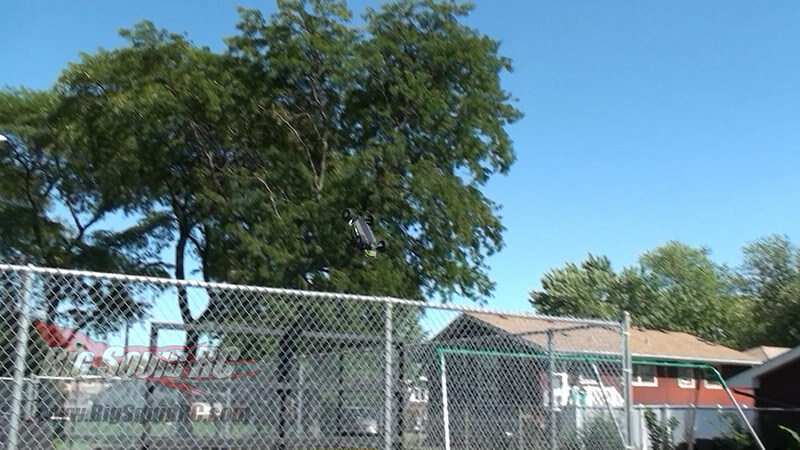 Power: On the radar gun, the Vanguard 2900Kv system on a 2S Lipo was getting about 24 mph, and on 3S about 33. Not bad speeds for a RTR vehicle, but we would of liked to have seen it quicker. Our kit version used the Castle 1410 3800 kv, and it has us flying with what we felt was an appropriate speed for the buggy. On-Road: While bashing in the parking lots, the EXO held it’s own. The stock tires work well on pavement (as well as dirt), and got us around the corners no problem. Broken Parts: We beat the EXO RTR up real good this time. Big air, parking lot tag, skate parks and general bashing, and didn’t break a single part. That being said, we did pop the shock caps off pretty early on some of the jumps. That does not really count as a break, but more of a nuisance. Did the shock caps from those guys in Texas? 30 seconds into driving our EXO we popped a front dog bone. We replaced it.. only to loose it again a few minutes later. We removed the dog bones for comparison, and found that the ones we had were 2mm shorter than what we were supposed to have. A quick call to Axial, it sounded like a handful of very early production RTR’s had a mix up and shipped with 94mm dog bones, when they should of been 96mm. Once we got the correct size installed, we have had no problems with them at all! So if you are having an issue with loosing them, this may be why. So RTR or Kit? This is a tough call for sure, and is going to come down to you and your preferences. The RTR version saves you a TON of time, is built well, and you don’t need to worry about buying all the extra stuff you need to be up and running. The kit version let us install slightly upgraded parts like steering servo and motor, but that stuff will cost you a little more cash. We don’t want to make the decision for you. Some people LOVE the kits, some people hate them. When the EXO was first announced we did a little complaining about how the battery was going to be installed, but after using it over and over it’s not to bad. Just like any other vehicle, you’ll remove a body piece, and install the pack. The straps work well, and are quick to do once you get the battery in. I’d like to see a similar setup on other vehicles with a little more room for my hands. In the end, the Axial EXO RTR looks great. The style and scale looks are hot, and it will get some serious attention at the track. With some fine tuning, you’ll be enjoying your time on the dirt, and hanging with the big boys. Best Mod Over $5: New shocks, or at least shock caps. Axial already has some sweet aluminum ones, so you may want to start saving for those. 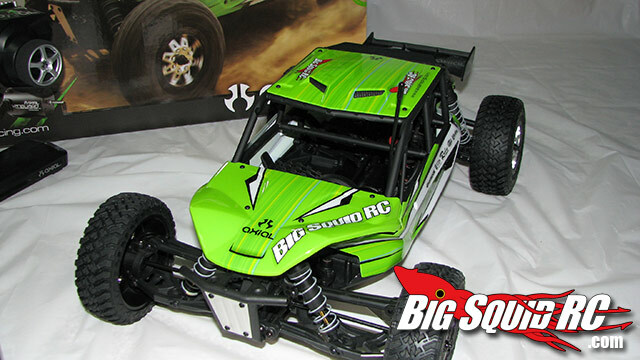 There are a bunch of hop-ups already for the EXO, you can read our Axial EXO hop-up review here! Time To Bash – 8.0/10 -Being a kit you are looking at roughly 8-20 hours to get your new EXO built and on track. Workability – 7.0/10 – The roll cage and body still up the difficulty when needing to get in there and work on something. Car Show Rating – 8.0/10 – The RTR looks good. I like the paint, the scale and style will turn heads anywhere you go. I do miss having people on the inside. Bash-A-Bility – 7.5/10 – Nothing broke, just some shock issues. More speed and less nose down would make for better bashing. Fun Factor – 7.5/10 – The buggy is fun to drive, but we still felt it was a little under powered. Handling – 8/10 – It handles the track well. Turns like it’s on rails, but you’ll need to be heavy on the throttle in the jumps. Value- 8/10 – The RTR is $179 more than the kit. It would be difficult to get a radio, servo, motor and ESC for that, but if you think you may want to upgrade a servo and motor in the future..
Big Squid Rating – 7.7/10 – Tentacles.. 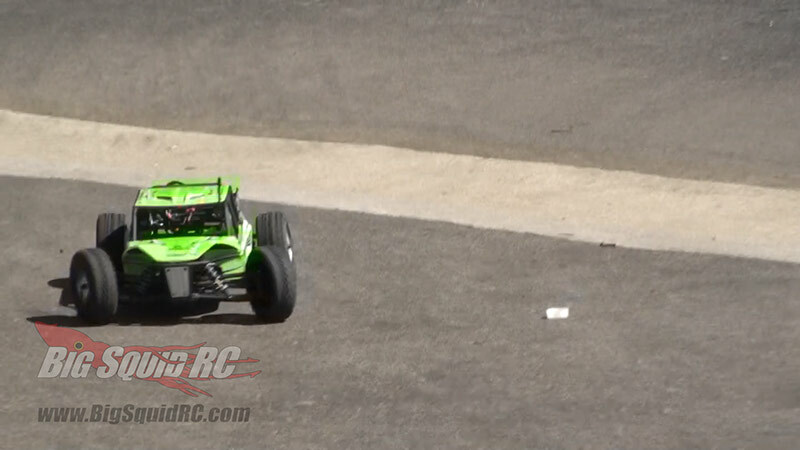 The Axial EXO RTR will get you into one of the hottest new classes fast. A couple of minor things keep it from score much higher, but most can be tweaked or tuned as needed. If you want to turn heads, and don’t want to deal with all the hours of building the kit, the RTR is for you! 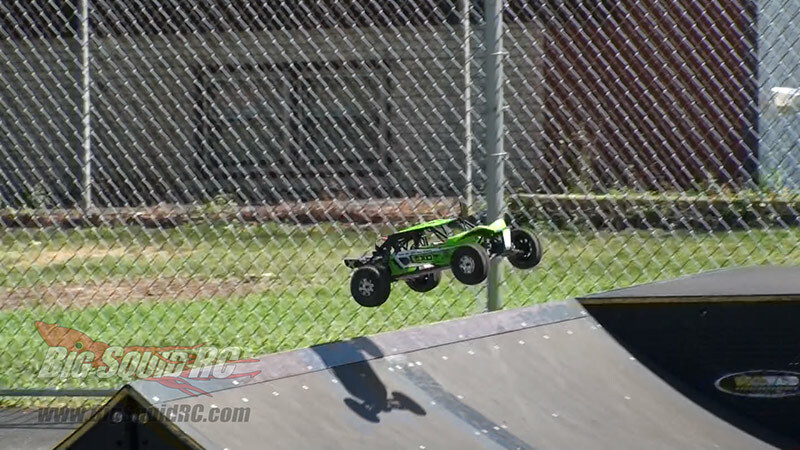 Don’t forget to check out the more detailed review of the kit Axial EXO here, and the Axial EXO hop-up review here!